Those of you who remember Jordan Brand know that the 3 Percent originally released some years back as a crosstrainer, but now JB breathes new life into the 3 Percent by making them court ready. (Real observant folk may have noticed Mike Bibby wearing them throughout the NBA Playoffs.) The Air Jordan Alpha 3 Percent Hoop keeps basically the same upper as the original, swapping out the trainer sole for one more fit for basketball complete with a Max Air unit in the heel. 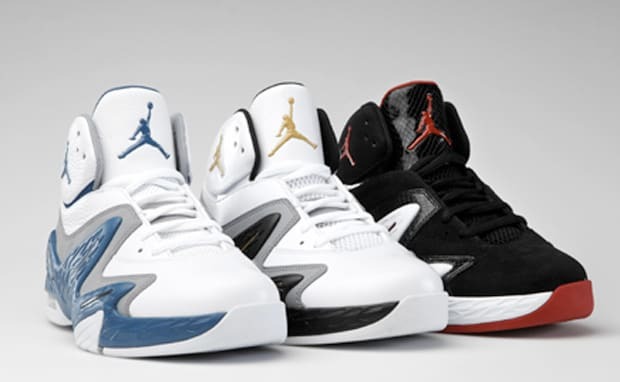 The new 3 Percent will be available in three classic Jordan colorways — White/French Blue – Stealth, White/Flight Gold – Stealth – Black and of course the Jordan staple of Black/Varsity Red – White. Look for these next month for about $115.